Hamline University is a private liberal arts college in Saint Paul, Minnesota. It was founded in 1854 and is known for its emphasis on experiential learning, service, and social justice. The university is named after Bishop Leonidas Lent Hamline of the United Methodist Church. Hamline was the first institution of higher learning in Minnesota and is one of five Associated Colleges of the Twin Cities. The university is composed of the College of Liberal Arts, School of Education, School of Business, and the Creative Writing Programs. Hamline is a community of 2,117 undergraduate students and 1,668 graduate students. Hamline was named in honor of Leonidas Lent Hamline, a bishop of the Methodist Church whose interest in the frontier led him to donate $25,000 toward the building of an institution of higher learning in what was then the territory of Minnesota. Today, a statue of Bishop Hamline sculpted by the late professor of art Michael Price stands on campus. Hamline is also distinct for being founded as a coeducational institution, a rarity in 19th-century America. Hamline's first home was in Red Wing, Minnesota. The school's charter stipulated that Hamline be located "at some point on the Mississippi between St. Paul and Lake Pepin." The city of Red Wing pledged about $10,000 to enable construction of a building and the beginning of an endowment, and it also donated a tract of land on a hillside overlooking the Mississippi River. Hamline University holds the title of the oldest university in Minnesota. It was charted in 1854 and began offering collegiate courses in 1857. While the University of Minnesota was chartered by the territorial authorities in 1851, it did not operate as a place of higher education until nearly two decades later. The first classes at Hamline were held in rooms housed on the second floor of the village general store while the construction of the classroom building was in progress. Students moved into the Red Wing building in January 1856. The original building contained a chapel, recitation rooms, a school room, a library, laboratory, reading rooms, and dormitory quarters. Seventy-three students enrolled at Hamline in the opening year. The catalog lists them separately as “Ladies and Gentlemen,” but most of them were children or adolescents. All were enrolled in either the primary or the preparatory department. There was no collegiate division – the frontier had not yet produced students ready for college. Tuition ranged from $4.00 to $6.66 per term. 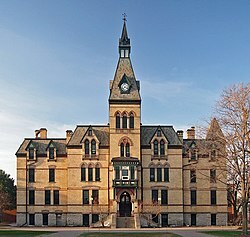 The collegiate program was introduced in 1857, and in 1859, Hamline graduated its first class. With the start of the American Civil War, enrollment in the college division dropped from 60 to 16 in one year. There was no graduating class in 1862. Records indicate that 119 Hamline men served in the Union armies during the war. In 1869, the university shut down. The first building at the Red Wing site was torn down in 1872. In the center of this 1874 map is the new St. Paul Hamline University campus that was under construction. Here it is labeled "College Place." It had been expected that Hamline would reopen on a new site within two years after the closing at Red Wing; however, indecision in the selection of a new site caused a delay. In the end, a 77-acre (31 ha) Saint Paul prairie plot halfway between the downtowns of Minneapolis and Saint Paul was selected. Construction began in 1873, but by then an economic depression had overtaken the planners, and there were repeated postponements and delays. University Hall, begun in 1873, was constructed in installments as money came in, and was not completed until the summer of 1880. The doors opened on September 22, 1880, and Hamline's history in Saint Paul began. The catalog for that year lists 113 students, with all but five of them being preparatory students. Tuition in the collegiate division was $30 per year. Two degrees were offered at the time: the B.A. and the B.S. In 1883, the bachelor of philosophy degree replaced the B.S., and remained in use until 1914, when the faculty dropped the PhB. and restored the B.S. degree. On February 7, 1883, University Hall, barely two years old, burned to the ground. To replace the structure, plans for a new University Hall were prepared. Eleven months later, the new structure, the present Old Main, was completed. Emergency space for classrooms was provided by Ladies' Hall, which had opened in 1882. Other new construction included Science Hall, which was completed in 1887, the Carnegie library in 1907, and the new gymnasium, which was completed in 1909. When World War I came in April 1917, track and baseball schedules for spring were cancelled as enlistments and applications of officers' training depleted the teams. Hamline was designated one of 38 colleges in the country to supply men for ambulance work in France. Twenty-six men were selected for the unit and served in France with the 28th Division of the French Army. Ambulance work during World War I involved great personal danger and took great expertise to stay alive. Three former students of Hamline University, Wallace Ramstad, Glen Donaldson, and Walter Gammel died in battle. One of the more notable situations the Hamline ambulance unit, otherwise known as Section 568, was involved in was the fighting in the Meuse-Argonne territory, which lasted forty-seven days. During the war, Section 568 proudly retained the banner that girl students from Hamline had sewn for them before their training. Eventually, by the end of the war Section 568 received the Croix de Guerre from the French government for their service. In the fall of 1918, a unit of the Students' Army Training Corps was established at Hamline, and almost every male student became an enlisted member. The Science Hall was used for military purposes, with the basement becoming the mess hall and the museum and several classrooms being marked for squad rooms and sleeping quarters. The Great Depression and World War II created significant challenges for Hamline. The most difficult were the years in the early 1930s, in which the repercussions of the depression were intensified by conflicts over internal reorganization. Increased enrollments reflected the belief that it was better for students to be in college than to be sitting at home in idleness and despair. The college tried to help by providing jobs and financial aid, and by lowering charges for tuition and room and board. Jobs of any kind were at a premium, with the most prized being board jobs in the Manor House and at the Quality Tea Room on Snelling Avenue. Also in top demand were board and room jobs for women in private homes. In the meantime, the portion of the college endowment invested in farmlands turned unproductive, and the university's income fell following reductions in tuition. All of this led to annual deficits and substantial cuts in faculty salaries. It was not until 1935 that Hamline began to recover from the depression. During the war years, Hamline's enrollment held above 600, except in 1943 and 1944. Although males registrations dropped as men entered the armed services, women's enrollment increased as nursing students arrived. Hamline and the Asbury Methodist Hospital of Minneapolis launched a new venture in 1940 when they collaboratively established the Hamline-Asbury School of Nursing, which offered a five-year program leading to a bachelor of science in nursing. Hamline moved with a growing trend to provide academic training for women preparing for careers in nursing. A three-year program leading to a diploma in nursing was also offered. In 1949, the Mounds-Midway School of Nursing joined the school, and the newly enlarged institution took the name of the Hamline University School of Nursing. A flood of veterans entered or returned to college after World War II under the G.I. Bill of Rights. The first reached the campus in the fall of 1946, when registrations passed 1,000 for the first time. Enrollment reached a new high in 1949 when 1,452 students, including 289 in the nursing school. The nursing school, which had been an integral part of Hamline since 1940 and had won wide recognition for the excellence of its program, was discontinued in 1962 following a decision to concentrate resources and staff on liberal arts programs. The last class in the three-year program graduated in 1960 and the last class in the degree program graduated in 1962. A total of 447 women completed the degree program, and 758 women finished the three-year program. After World War II, two new residence halls were built – Drew Residence for men and Sorin Hall for women. A new fine arts center was completed in 1950, and the Drew Hall of Science was dedicated in 1952. The old science building was taken over by the social science and other departments and was renamed Social Science Hall. In 1963, the A.G. Bush Student Center was completed, and at the time, its modern facilities made it at once the social, recreational, and cultural center of the campus. Throughout this period, buildings were enlarged or remodeled to keep pace with new needs and standards. Wings were added to the Manor House and Drew Residence. The seating capacity of the library was increased to 100 with the completion of a new periodical room, and the old student union was remodeled and turned into a laboratory with classrooms and office space for the language departments. In the summer of 1966, extensive alterations and improvements were made in Hutton Arena and in the theater of the fine arts center. Between 1953 and 1966, faculty members received grants totaling more than $600,000 for special education and research programs. Hamline broke ground in May 1970 for the $2.6 million Bush Memorial Library. The library, a three-story, 83,210-square-foot (7,730 m2) building housing some 240,000 volumes, opened in the fall of 1971. The Paul Giddens Alumni Learning Center, linked to the Carnegie library and named for a former university president, opened in October 1972. The social science and humanities divisions and the department of education are now housed within the center, which also contains classrooms, study areas, and laboratories. The university began construction on a new $4 million law school building in January 1979, which was dedicated in October 1980. The Hamline University School of Law received accreditation from the American Bar Association in 1975. The law school began publishing the Hamline Law Review in 1978 and a second, student-edited, journal in the spring of 1980 – the Journal of Minnesota Public Law (since 1986, it has been known as the Hamline Journal of Public Law and Policy). In 1983, in collaboration with the Council on Religion and Law at Harvard University Divinity and Law Schools, the Hamline School of Law launched a faculty-edited journal, the Journal of Law and Religion. After the Charles M. Drew Fine Arts Center opened in 1950, Hamline began to gradually acquire a permanent art collection, especially after Paul Smith became chair of the fine arts department in 1965. By 2003, the permanent collection included more than 600 original works. The $1.3 million Sundin Music Hall opened in October 1989. The Orem Robbins Science Center was dedicated on May 9, 1991, and became the home of the biology, chemistry, and physics departments. Old Main, the campus landmark, was placed on the National Register of Historic Places; it was renovated during the summer of 1978 and again after a fire on September 2, 1985, caused $10,000 worth of damage. In October 1990, workers began a $290,000 renovation. They removed and rebuilt a 24-foot (7.3 m)-high section of the tower, covered the 106-year-old building with new concrete shingles, and installed a four-sided clock in the tower. In 1993, an electric carillon was added to the tower that can ring a bell and play selected music. Hamline broke ground on September 27, 1996, for the $5.6 million, 44,000-square-foot (4,100 m2) Law and Graduate Center/Conference Center, which was dedicated on October 10, 1997. Hamline began construction on a $7.7 million student apartment building at 1470 Englewood for 142 graduate and law students on September 2, 1998. The building was completed in 2000, in time for students to move in for the fall term. After four years of planning, ground was broken on October 18, 1996, for an $8.5 million sports, recreation, and health complex—Lloyd W. D. Walker Fieldhouse—though construction did not begin until the following spring. The completed fieldhouse, at Snelling and Taylor, opened on September 10, 1998. Klas Center, a modern, $7.1 million multi-use facility which includes the football field and a track, was built in 2003 to replace the aging Norton Field. As the campus was transformed by construction projects, attention turned to Hamline's roots in the summer of 1996. An archaeological dig headed by John McCarthy of the Institute of Minnesota Archaeology and anthropology professor Skip Messenger began at the site of Hamline's original building in Red Wing. The three-story brick building, constructed in 1855 and open in time for classes to begin in January 1856, closed in 1869 and was demolished in 1871. Since few records exist from that time, the exact location and dimensions of the original building were unknown until the archaeological dig. The dig found that the original building's foundation was insufficient for its size, leading to speculation that structural problems might have contributed to the building's closing and eventual demolition. In 2004, Hamline celebrated its 150th anniversary. Throughout the year, every department held a public event related to the anniversary. The slogan for the event was "Looking back. Thinking forward." In 2011, Hamline eliminated the French major. In the autumn of 2012, Hamline students and faculty protested the school's refusal to condemn the proposed Minnesota constitutional amendment that would have banned equal marriage rights for all citizens. Hamline's attempt to stay neutral on the issue was seen as inconsistent with the university's anti-discrimination policy and its espoused values of diversity and inclusiveness, as well as with its United Methodist heritage and identity, since the Minnesota Annual Conference of the United Methodist Church had voted to publicly oppose the amendment. In June 2014, Hamline's adjunct professors voted to form a union as part of the SEIU, making Hamline the first private university in Minnesota where adjunct faculty formed a union. In April 2015, Hamline University announced that Dr. Fayneese Miller would become the 20th President of Hamline on July 1, 2015. On July 1, 2015, Dr. Miller became the first African American to be President of Hamline University and the second woman to hold that office. The College of Liberal Arts houses Hamline's undergraduate programs. College of Liberal Arts students can earn a bachelor of arts or bachelor of science degree in 41 areas of study. Hamline is one of only 276 Phi Beta Kappa institutions in the country. The majors offered are typical of a liberal arts college, and include the physical and social sciences, humanities and fine arts. Students may also minor in 38 areas of study within the college. One-hundred percent of students complete an internship, collaborative research, a service learning project, or field-based research. The undergraduate student to faculty ratio is 12:1 and the median class size is 18. Almost all (94%) faculty hold the highest degree in their fields. Hamline competes in 20 intercollegiate sports in the NCAA Division III Minnesota Intercollegiate Athletic Conference. In addition to sports, Hamline has more than 70 clubs and organizations. Hamline also has an alliance with Hamline Elementary School, which is a public elementary located across the street from the university. Hamline University's School of Education houses graduate and undergraduate programs. For undergraduates, Hamline students pursue a BA or BS degree in the liberal arts, combined with a co-major in education and a Minnesota teaching license. Hamline has six graduate programs in education, including a doctorate in education, and professional development opportunities for educators than any other private institution in Minnesota. Hamline offers three fine arts degrees in creative writing: the BFA, an MFA in Creative Writing, and a low-residency MFA in Writing for Children and Young Adults. Hamline's Bachelor of Fine Arts in Creative Writing is the only such degree in the Twin Cities and the only one in the state of Minnesota offered by a private liberal arts university. Hamline University School of Business contains both the undergraduate and graduate business programs. The undergraduate program offers a Bachelor of Business Administration (B.B.A.) and Bachelor of Arts in Economics. The school offers minors in business analytics, business practice, economics, management, and nonprofit management. In 2017, Hamline was ranked 20th in the Midwest among 171 universities according U.S. News & World Report magazine's “Best Colleges” edition. Washington Monthly ranked Hamline first in Minnesota and 27th nationwide in its Master's Universities category in 2016. Hamline also made the publication's Best Bang for the Buck- Midwest Colleges list. In 2016, Hamline was again among the nation's top colleges according to Forbes.com which considers success of grads and quality of education that biggest factors in rankings. In addition, Hamline was named a "Best Midwestern" School by Princeton Review; rankings reflect academic strength, institutional data, reputation, and student input. Hamline is a member of the Associated Colleges of the Twin Cities (ACTC), which is a consortium of five private liberal arts colleges, all located in either Minneapolis or Saint Paul. This program allows students to take classes at any of the associated campuses, as long as the class is not offered at their home university. Students are limited to one ACTC course per semester. Hamline also has partnerships with four foreign universities (Universität Trier in Germany, Universidad Catolica de Valparaiso in Chile, Universite Gaston Berger in Senegal, and Akita International University in Japan) which allow students to study abroad and pay the same rate that they would at Hamline. These programs also guarantee that credits earned abroad will transfer back to Hamline. Hamline students have the opportunity to partake in various on-campus activities. All clubs, intramural teams, and student events are run through the Student Affairs Division. Hamline's clubs include organizations with focuses on various academic subjects, the arts, journalism, culture, advocacy/social justice, recreation, and spirituality. Hamline also has two Greek organizations: Delta Tau sorority and Theta Chi fraternity, both of which are located a block west of campus. The two largest on-campus organizations are the Hamline Undergraduate Student Congress (HUSC) and Hamline University Programming Board (HUPB). HUSC is the governing body of the undergraduate students, with the stated purpose of providing an organized medium for expressing student concerns to the administration. It is also responsible for overseeing and funding the majority of student organizations on campus. HUPB plans student events, such as the homecoming dance, End of the Semester Party, and the annual lip sync contest. Drew Hall houses 200 undergraduate men and women. The hall is staffed by resident advisors on each floor, an assistant hall director and one area coordinator. Drew was built in 1946 as a men's residence after a donation by Charles M. Drew. Manor Hall is the oldest dormitory on the campus. It was built in 1922 as a women's dormitory, although today it is co-ed. Manor is home to second-, third- and fourth-year undergraduates. Sorin Hall was built in 1958 and houses just over 100 men and women on single-gender floors, including two female floors and one male floor. Osborn, Peterson and Schilling Residence Halls collectively known as the Heights, are identical buildings built in the late 1960s. Each houses nearly 100 first-year men and women. The primary dining hall is located in The Carol Young Anderson and Dennis L. Anderson Center, often referred to as Anderson. The facility is operated by a private food management firm, ARAMARK. The dining hall is all-you-can eat, charging a flat rate for entry, regardless of how much food is consumed. Meal plans are available for students. Included in the purchase of a meal plan is a certain amount of money that can be used at other facilities on campus ("declining balance" dollars). This money can be spent by using the student ID card like a debit card. Hamline's student newspaper is The Oracle. The Oracle was founded in 1888 and has been published regularly ever since. The paper began as a monthly journal of letters and evolved into a modern weekly college newspaper over the years. The Oracle receives its funding from and is published by the Student Media Board, which serves as an umbrella organization for the Liner, the university's yearbook, the Fulcrum, the university's literary magazine, and Hamline University Radio. Hamline University is the "birthplace of intercollegiate basketball." In 1894, then-Athletic Director (and student) Ray Kaighn, who had played on James Naismith's very first basketball team, brought the sport to the university when it was just over two years old. A women's program was organized the next year. On February 9, 1895, Hamline hosted the first intercollegiate basketball game in history, when the Minnesota State School of Agriculture (now the St. Paul campus of the University of Minnesota) defeated Hamline by a score of 9–3. The game was played in the basement of the university's old science building using Naismith's original "peach basket" rules, and featured nine players to each side. Hamline was once known for the strength of its basketball program, with the university considered to be a national power in the sport from the 1930s to the 1950s. Hamline produced a number of NBA players during this time, including Hall of Famer Vern Mikkelsen. Then-head coach Joe Hutton, Sr. (1931–65) was once offered and turned down a chance to coach the Minneapolis Lakers. Hutton Arena, the home court for the Piper basketball and volleyball teams, was built in 1937. Originally named Norton Field House, it was renamed after Hutton. A statue of the coach is in the lobby of the building. Hamline appeared in the NAIA National Tournament 12 times from 1940 to 1960 Hamline is one of 3 schools to place 4th (1940) 3rd (1948) 2nd (1953) and 1st (1942,1949,1951). They were the first school to win three National Championships, consecutively or non-consecutively. Their NAIA tournament record is 36-10. Hamline University is a member of the Minnesota Intercollegiate Athletic Conference (MIAC). This table displays the number of Minnesota Intercollegiate Athletic Conference (MIAC) conference championships that have been won by Hamline sports teams. If a sport is not listed, then a championship has not been won in that competition. Hamline fields teams in the following men's sports: baseball, basketball, cross country, football, hockey, indoor track and field, soccer, swimming and diving, tennis, and outdoor track & field. Hamline also fields teams in the following women's sports: basketball, cross country, hockey, indoor track and field, soccer, softball, gymnastics, swimming and diving, tennis, outdoor track and field, volleyball, and lacrosse. Women's lacrosse was added as an official Hamline University sport and the team officially competing in the spring of 2016. All records were compiled from the MIAC website and are up to date as of May 2017[update]. In gymnastics, Hamline competes in the Wisconsin Intercollegiate Athletic Conference. In lacrosse, Hamline is a member of the Midwest Women's Lacrosse Conference. Patricia Anderson – former Minnesota state auditor and mayor of Eagan, MN. Matt Bostrom – sheriff of Ramsey County. Burnett M. Chiperfield – former member of U.S. House of Representatives representing Illinois. Alan D. Clemmons – current member of South Carolina House of Representatives. Tom Dooher – former president of Education Minnesota, AFT, NEA, AFL-CIO. Bill Frenzel – former member of U.S. House of Representatives representing Minnesota. Barb Goodwin – current member of Minnesota State Senate. Anna Arnold Hedgeman – Civil rights leader and Hamline's first African-American graduate. Gordon Hintz – current member of Wisconsin State Assembly. Yi Gang – Governor of the People's Bank of China and former Director of the State Administration of Foreign Exchange. Christine Jax - former Commissioner of Education Minnesota Department of Education. Martin Maginnis – former member of U.S. House of Representatives. Carly Melin – current member in the Minnesota House of Representatives. John J. Mertens – former member of the South Dakota House of Representatives and the South Dakota Senate. Adolphus Peter Nelson – former member of U.S. House of Representatives representing Wisconsin. Anthony Sertich – former Majority Leader of Minnesota House of Representatives. Heidi Swank – current member of the Nevada State Assembly. Van Tran – former member of the California State Assembly. Kerry Trask – former candidate for Wisconsin State Assembly. Oscar Youngdahl – former member of U.S. House of Representatives. Duane Benson – American football linebacker formerly of the Oakland Raiders, Atlanta Falcons, and Houston Oilers. Logan Clark – professional mixed martial artist and college football player for Hamline University. Carl Cramer – former professional football player. Lew Drill – former professional baseball player. Joe Hutton – former professional basketball player. Raymond Kaighn - Organizer of the first intercollegiate basketball game. Basketball Hall of Fame (1959) as a player on Naismith's First Team. Marty Norton – former professional football player. William Fawcett – film and television actor. Clinton Sundberg - film and theatre actor. John Bessler – professor of law and husband of U.S. Senator Amy Klobuchar. John Kenneth Hilliard – academic and Academy Award recipient. Edwin W. Rawlings – one of the USAF's youngest generals. Lester Mondale – former American Humanist and Unitarian, and only person to sign all three Humanist Manifestos. D. Paul Rader - Early radio evangelist and hymn composer. Credited as being the first televangelist to preach to a nationwide audience. ^ "U.S. and Canadian Institutions Listed by Fiscal Year 2016 Endowment Market Value and Change* in Endowment Market Value from FY2015 to FY2016" (PDF). NACUBO. February 2017. Archived from the original (PDF) on 2017-02-15. Retrieved 23 March 2017. ^ "Hamline University Faculty Composition". College Factual. 20 February 2013. Retrieved November 5, 2017. ^ "Young Adult and Higher Education Ministries". Minnesota Annual Conference of the United Methodist Church. Archived from the original on 2009-09-10. Retrieved August 17, 2009. ^ a b Jarchow, Merril (1978). Private Liberal Arts Colleges in Minnesota: Their History and Contributions. Minnesota Historical Society. ISBN 0-87351-081-X. ^ "Hamline Undergraduate Admissions". www.hamline.edu. Retrieved November 5, 2017. ^ "About Hamline University". www.hamline.edu. Retrieved November 5, 2017. ^ Alumni Directory Hamline University 1854–1966 (St. Paul, MN, 1966), 22. ^ JOHNSON, JACK K. (2015). ""OUR UNITED EFFORT": HAMLINE UNIVERSITY'S WORLD WAR I AMBULANCE COMPANY". Minnesota History. 64 (8): 320–329. doi:10.2307/24898890. JSTOR 24898890. ^ "Hamline University: 150 Years". Hamline.edu. Retrieved 2008-10-08. ^ "French Major". Hamline.edu. Retrieved 2014-06-27. ^ "Hamline's decision to stay neutral on marriage amendment sparks protest". City Pages. Archived from the original on 2014-07-29. Retrieved 2014-06-27. ^ "Hamline University Faculty Votes To Oppose Marriage Amendment". WCCO 4 Television. 2012-09-26. Retrieved 2015-09-22. ^ "Religious leaders unite to oppose marriage amendment". Minnesota Public Radio News. 2012-06-07. Retrieved 2015-09-22. ^ "Hamline adjunct faculty votes for union". Star Tribune. Retrieved 2014-06-27. ^ "Hamline' s 20th University President Named". www.hamline.edu. Retrieved November 5, 2017. ^ "Academic Programs | Hamline University". www.hamline.edu. Retrieved 2017-06-15. ^ "Fast Facts | Hamline University". www.hamline.edu. Retrieved 2017-06-15. ^ "Undergraduate Education Programs | Hamline University School of Education". www.hamline.edu. Retrieved 2017-05-17. ^ "School of Education | Hamline University Saint Paul, MN". www.hamline.edu. Retrieved 2017-05-17. ^ "Undergraduate Creative Writing | Creative Writing Programs | Hamline University". www.hamline.edu. Retrieved 2017-05-17. ^ "Master's Universities (Midwest) Rankings – Best Colleges – Education – US News and World Report". Colleges.usnews.rankingsandreviews.com. Retrieved 2008-10-09. ^ "Hamline University Rankings" (PDF). Hamline.edu. Retrieved October 14, 2016. ^ "Hamline University: Student Administrative Services". Hamline.edu. Retrieved 2009-01-28. ^ "Hamline University: College of Liberal Arts". Hamline.edu. Archived from the original on September 6, 2006. Retrieved 2009-01-28. ^ "Student Affairs | Hamline University". www.hamline.edu. Retrieved 2017-06-15. ^ "Hamline University: Student Clubs & Organizations at Hamline". Hamline.edu. Retrieved January 12, 2009. ^ "Hamline University: Hamline Undergraduate Student Congress". Hamline.edu. Retrieved June 15, 2017. ^ "Hamline University Programming Board (HUPB)". Hamline.edu. Retrieved June 15, 2017. ^ "Hamline University Residential Life: Drew Residence Hall". Hamline.edu. Retrieved 2009-01-22. ^ "Hamline University Residential Life: Sorin Residence Hall". Hamline.edu. Retrieved 2009-01-22. ^ "Hamline University Residential Life: The Heights: Osborn, Peterson and Schilling Residence Halls". Hamline.edu. Retrieved 2009-01-22. ^ "The Campus Dish: Bishop's Bistro". Campusdish.com. Retrieved June 15, 2017. ^ "The Oracle: General Information". Hamlineoracle.net. Retrieved 2009-01-15. ^ "Hamline University: Hutton Arena". Hamline.edu. Retrieved October 8, 2008. ^ "Hartman: Getting John Kundla to coach Minneapolis Lakers no easy task". Star Tribune. July 2, 2016. Retrieved June 15, 2017. ^ "Championship History - NAIA" (PDF). Retrieved June 15, 2017. ^ "Minnesota Intercollegiate Athletic Conference". Miac-online.org. Archived from the original on 2009-04-20. Retrieved 2009-11-24. ^ Geiger, Matt (June 2, 2007) "Success in mixed martial arts helping Logan Clark reach goal of becoming a teacher" Archived 2007-08-11 at the Wayback Machine, Winona Daily News. ^ "Again Takes Writer Part". The Ogden Standard-Examiner. Utah, Ogden. November 21, 1937. p. 24. Nute Lee, Grace. (1987). In Hamline Halls 1854–1954. St. Paul, MN: Hamline University. Johnson W., David. (1980). Hamline University A History. St. Paul, MN: North Central Publishing Company. ISBN 0-935476-04-0. Alumni Directory 1854–1966. St. Paul, MN: Hamline University. 1966. Johnson W., David. (1994). Hamline University: A History 1854–1994. St. Paul, MN: Hamline University Press. ISBN 0-9633686-3-X. Pace Nelson., Charles. (1939). Hamline University. Minneapolis: Lund Press, INC.
Porter L., David. (2005). Basketball A Biographical Dictionary. Westport, CT: Greenwood Publishing Group. ISBN 0-313-30952-3. Wikimedia Commons has media related to Hamline University. This page was last edited on 14 April 2019, at 04:48 (UTC).